See the destinations most requested by our visitors. Montevideo, Colonia, Punta del Este, La Paloma, Piriápolis y La Barra - José Ignacio. The best way of touring Uruguay. Hotels and the most diverse lodgings are part of the most requested section by visitors to Welcome Uruguay. At our tourist website, you can easily access all the lists of hotels, cabins, inns, apart hotels and hostels in every city in Uruguay. Just choose your destination and start organizing your stay. One of the largest groundwater reservoirs in the world spreads all along the shores of the Uruguay River: the Guaraní Aquifer. At this spot, the waters reach the surface of the earth at a temperature ranging between 38 and 46° C. As a result, this site is an excellent hot spring destination. 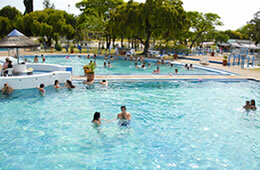 Hot spring resorts and aquatic parks are part of this section. The famous Llamadas (calls) or the stage murgas disputed on Carnival nights are appreciated by visitors from all round the world during January and February. Thousands of men and women celebrating one of the most attractive popular festivals in Montevideo: the Carnivals. The typical color and rhythm of the Uruguayan carnivals. Uruguay`s past and present on a tour around its museological institutions.